It's not Pikachu, it's Mimikyu. When Pokemon Sun and Moon's Mimikyu, the lonely ghost/fairy-type that wears a Pikachu costume, was first revealed, the monster's sad story tugged at the heartstrings of many fans. According to the official website, Mimikyu is "dreadfully lonely," and began wearing a Pikachu costume in an effort to make friends. Mimikyu is particularly drawn to dark places, as its health will fail when it is exposed to the sun. Reading about it is one thing, but listening to Mimikyu sing a song about how lonely it is and how badly it wants friends is a whole other story. 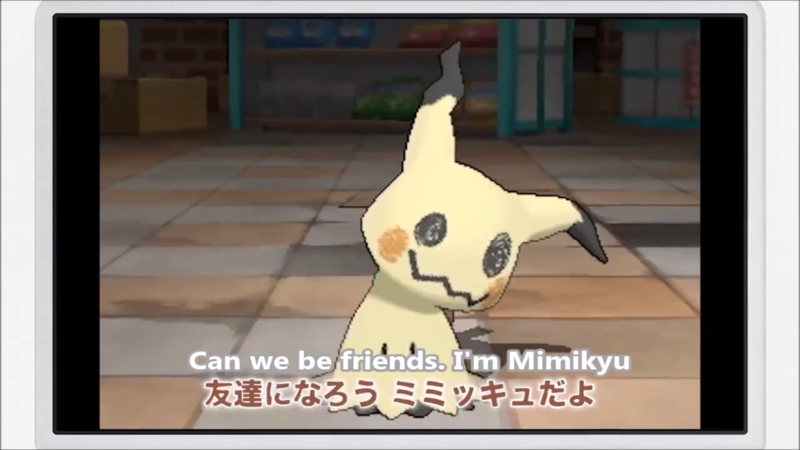 In a video posted to the Japanese Pokemon YouTube channel, with subtitles added by YouTuber Tobias, Mimikyu reminds us that it is more than a Pikachu wannabe - it's Mimikyu, and it wants to be friends with you.